Lulu Letlape is the Vice President for Corporate Affairs at South32. She has over 20 years’ experience in stakeholder management, communications, public relations, community development, sustainability management and reputation management. Prior to joining South32 (which was previously BHP Billiton), Lulu was the Executive Head for Group Corporate Affairs and Sustainability at Sanlam where she was responsible for Group Communications, Sustainability Management, Sanlam Foundation and Public Affairs. Before joining Sanlam, she was Executive Director of Corporate Affairs at Mercedes Benz and Group Executive for Communications at Telkom. 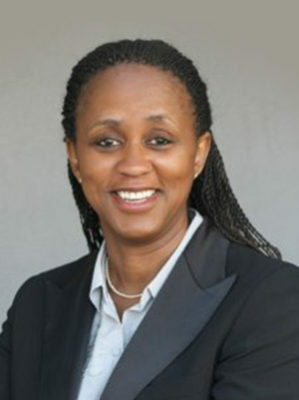 Lulu currently serves as a Chairman of Autopax, a Non-Executive Director and Chairman of the Sustainability Committee at Workforce Holdings Limited and a Trustee of Ditikeni Holdings. She previously held a Non-Executive Directorships at Optimum Coal Holdings and PRASA. Lulu holds a Master’s Degree in Management from the University of the Witwatersrand, a Bachelor of Arts and Bachelor of Education degrees from the University of KwaZulu Natal and a Breakthrough course for Senior Executives from IMD Business School in Switzerland. Lulu is a member of the International Women’s Forum of SA (IWFSA), a fellow of the Africa Leadership Initiative (ALI) and a member of the Aspen Leadership Network.